On Tuesday September 18th, 2018, Building Energy Exchange hosted an exclusive tour of an apartment unit in Gramercy Townhouse, a 4,500 square foot luxury vacation rental home and Manhattan’s first Passive House apartments. The tour was led by architect In Cho, founder of ChoShields Studio, the Certified Passive House multi-disciplinary architectural firm behind the renovation. Brian Starr, General Manager of Gramercy Townhouse provided insights on guests’ experience of the Passive House vacation home. This program was offered in conjunction with Celebrate NYC: EnerPHit Showcase, a panel event that was on September 12th, featuring NYC retrofits reaching the rigorous EnerPHit standard. In Cho with Wolfgang Feist, passive house co-founder. In Cho presenting at the Vienna International Passive House Conference. In Cho, of ChoShields Studio was honored to present at the NAPH 2016 in NYC. She presented the Manhattan two family townhouse gut renovation – that is to be certified under the Enerphit Component certification. 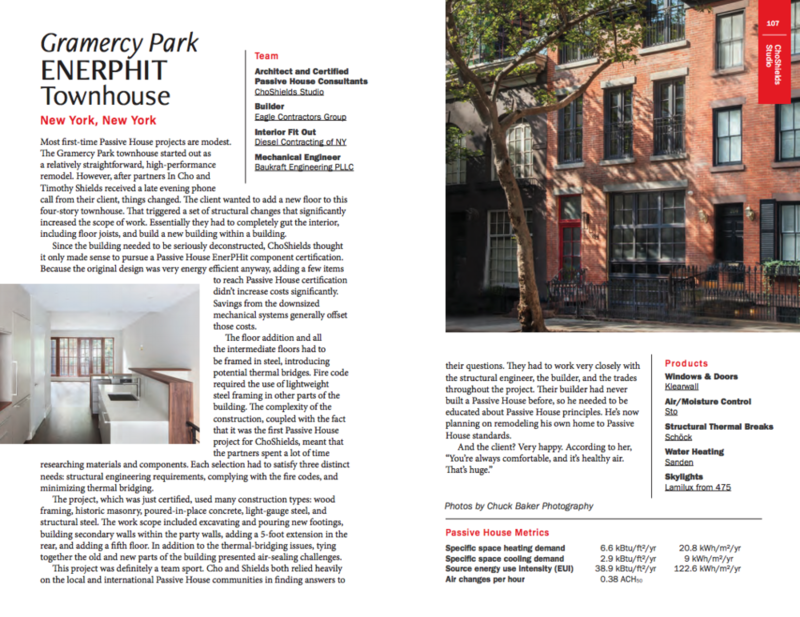 ChoShields Studio was pleased to have participated in the Open House Tour showcasing their Manhattan two family townhouse – to be certified Enerphit-Component Certification.